Martijn Koenen, the founder of Alter Stories was born in 1976, in the Netherlands. 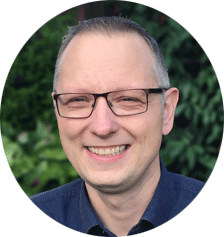 Martijn lives with his wife and two children in Hengelo, the town where he grew up, and has more than twenty years of experience working as an ICT Specialist. An avid nature enthusiast, Martijn enjoys hiking with his family, as well as keeping bees. A certified beekeeper, Martijn has several hives at his home and harvests his own honey every summer. Martijn’s wife, Debby, is a graduated primary school teacher and has a Masters in SEN, Special Educational Needs. She teaches children suffering from chronic disorders, and is the proud author of several books which help children and young people to cope with grief and loss. When Martijn was nine, he was given a Commodore Amiga, which sparked an undying love of adventure games. As he got older, his love for storytelling only grew, and his dreams of weaving exciting tales only called to him more. But, Martijn knew that a great story is not only about the writer, but also about the reader. And so, an idea occurred - why did those two things need to be separate? Was there a way that they could be combined into one, wonderful idea? Development began on Alter Stories in 2014, and within a year, the dream was a reality. Alter Stories seeks to fuse together reader and writer, letting the former take control of the story and add to it in ways that the writer never could alone. Martijn hopes to see his vision realised, by bringing together a thriving community of readers and writers. And that is his most sincere hope, that you read this, and that you see his idea and his dream not for what it is, but for everything it could be. If you’d like to be a part of Alter Stories, and don’t quite know where to begin, then Martijn and his team would love to hear from you. Just send an email to: hello@alterstories.com and someone will be delighted to reply to any questions you may have.